Don Saccone of Valet4ME opens the door for Mandy Houston outside Zapoteca restaurant in Portland Thursday, August 2, 2012, after retrieving her car. Sean Fletcher of Valet4ME gets into a car at Sebastian's restaurant on Fore Street in Portland Thursday, August 2, 2012 and parks it for a customer. 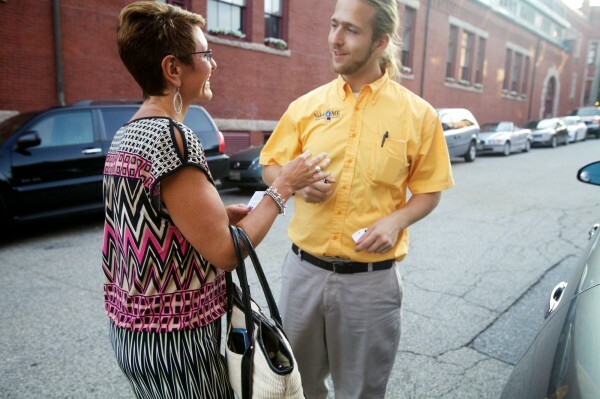 Kelley Bues hands her car keys to Sean Fletcher of Valet4ME outside Sebastian's restaurant on Fore Street in Portland's Old Port Thursday evening, August 2, 2012. Valet4ME owner Carl Loomis (left) and Sean Fletcher wait for customers outside Sebastian's restaurant on Fore Street in Portland Thursday, August 2, 2012. PORTLAND, Maine — A car full of diners, with reservations to eat at one of Portland’s top restaurants, was about to give up and leave the city when they stumbled upon Carl Loomis standing in front of Sebastien’s, a six-week-old addition to the local scene. “They said, ‘We’ve been driving around for 20 minutes and can’t find a place to park — can we leave the car with you?’,” Loomis recalled Thursday. Loomis, founder of the city’s first valet service, was happy to oblige. And Sebastien’s welcomed a car load of diners who didn’t have plans to eat there initially. The Boothby Square restaurant is one of three — along with fellow Fore Street hot spots Zapoteca and The Pearl — to contract Loomis’ Valet4ME to park customers’ cars. “Like everyone else, I thought, ‘This is Portland. You’re going to struggle to find parking and that’s just the way it is,’” Loomis said. But when Tom and Shannon Bard — who came to Portland after living in places like California and Massachusetts, where valet service is a regular part of fine dining — opened Zapoteca about a year ago, they weren’t so resigned to defeat in the city’s often frustrating parking game. Already friends with Loomis, the Bards mentioned their wish that a third-party valet service was available in the area, and Loomis jumped at the idea. 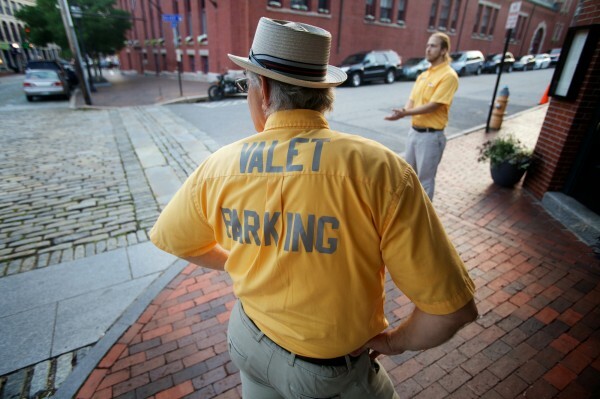 Soon, Tom Bard said, the valet service was one of Zapoteca’s major selling points. Displayed among Loomis’ promotional materials is a testimonial from a Windham woman who said she never ventured into Portland’s downtown to dine because she dreaded circling in search of a parking spot. But she started making date nights at Zapoteca because she knew she could avoid the hassle. The price to park in Portland is increasing as well, with the City Council in May approving a budget that includes $160,000 in fee hikes at city-owned parking garages. On July 1, hourly prices in the city’s two garages — on Elm Street and Spring Street — jumped from $1.25 to $1.75. The plan also included an increase in daily rates from $12 to $21, and added a $10 administrative fee on monthly parking space renters. Loomis charges the restaurants a per-night fee, which varies depending on the needs of the restaurant and how many drivers he needs to station there, and provides the car parking free to the restaurant customers. Loomis now has four employees — with plans to hire two more soon — and leases 100 spots in a private lot. In addition to the three restaurants he currently valets for, Loomis said he is in talks with two others and believes he’ll have a clientele of at least five eateries by the end of the summer. His team includes a roving car that quickly ushers on-site drivers back and forth to the Valet4ME private lot to ensure customers can get their vehicles quickly when they’re ready to leave. Loomis said his group parks between 25 and 35 cars each night in the city, and he hopes the addition of more restaurants will increase those numbers still. He said that while out-of-state tourists are used to the routine, valet service is still somewhat foreign to Maine diners. Although that’s changing, he said. And Loomis teaches his valet workers to actively promote the restaurants they’re working for. The Valet4ME greeters tell passers-by — on foot or in cars — about the specials and wait times to help sell the cuisine and loosen up lobby logjams for hosts and hostesses. “On slower nights, Carl and his team will actually bring people into the restaurant,” Tom Bard said. Loomis said he believes his valet service, both by adding convenience and by actively promoting the restaurants streetside, creates more revenue for the venues than it costs. “Restaurants don’t realize how much money walks past their windows,” he said.